A pliolite resin based paint, ARCADAMP damp proofs interior wall surfaces. This white matt damp proof paint forms a bond with the substrate and eliminates the problem of persisting damp flaking and saltpetre efflorescence. ARCACEM , a cement-based waterproofing system, is designed to protect and waterproof cement and fresh mortar surfaces - particularly suited for waterproofing basements and pools. 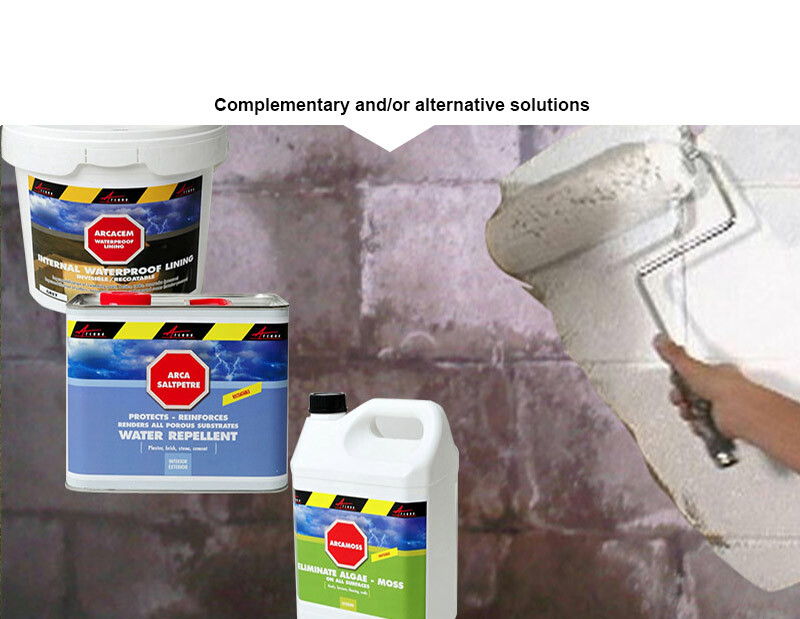 Use ARCASALTPETRE to solve the problem of damp crumbling plaster on interior walls, prevent saltpetre from growing in new walls and treat the saltpetre problem while reinforcing the substrate in old walls. ARCAMOSS is safe to use and environment-friendly. It will attack the problem at the root, eliminating any moss present and providing a long-term protection from future growth.